Take a drive along the Little Missouri River in the Badlands. Any time of the year it will yield some of the best views of the Badlands. Good hiking, good mountain biking, good camping and in the fall, good native color. Be prepared for a long scenic drive on gravel roads that weave through the North Dakota Badlands. You’ll be rewarded, even if you will want to wash your vehicle when you return to civilization. Gravel roads on the west side of the river, north of the Elkhorn Ranch provide stopping points where you can hike to the top of a hill to see sites like this. There’s not much water in the Little Missouri River in the fall. The North Dakota Badlands force the river to meander through western North Dakota from the south to the north. The lowlands around the Little Missouri River are lined with Cottonwood, Aspen, and Ash trees. They all turn yellow in the fall. You’ll see some variety with the evergreens, sage and other plants. We’ve found the best place to see the region is from some of the lookout points on the gravel road that runs north and south, west of the historic Elkhorn Ranch, Theodore Roosevelt’s cowboy home. The Yellow Gravel Road options are available from several places. Best bet is to turn west from Highway 85 and head into the heart of the North Dakota Badlands to find new sights you’ve missed. Take a look at this video to see the inspiring and stunning vista from one of the high points over the Little Missouri River. Other options include Upper Magpie or Lower Magpie roads you can access between Fairfield and Grassy Butte on Highway 85. Lower Magpie road is best and gives you the option of exploring the gravel roads of Blacktail Road or Goat Pass road. Drive to the Magpie Campground where you can get on the Maah Daah Hey trail to immerse yourself in the fall colors. Southwest of Grassy Butte is Magpie Campground along the banks of Magpie Creek, just off of Lower Magpie Road. From the bottom of the valley, fall colors are mixed. An early September morning in the South Unit of the Theodore Roosevelt National Park. The evergreen trees provide much of the fall color. On the low side along the Little Missouri River, you’re in the midst of the trees. Go up to Scoria Point or the leading edges of Paddock or Jones Creek trails and you’ll get a large vista. That fee you paid to get in the South Unit at Medora, is the same at the North Unit of the Theodore Roosevelt National Park. Even after the cottonwoods have dropped their leaves, the evergreen trees are still showing their colors at the North Unit of the Theodore Roosevelt National Park. The landscape is a bit more rugged. Bison are easier to see. If it’s color, you’re looking for, the Achenbach trail holds the best opportunity for seeing Badlands autumn colors. From the Achenbach trail, you can get a sweeping view of the Little Missouri River. There are short sections for a hike of a couple of hours. Many people make it simple and drive up to the Overlook then walk back toward the east to see the views from the Achenbach Trail. The woodlands are thick at the point where the Missouri River and the Yellowstone River meet on the North Dakota-Montana border. Colors are thick as geese use the rivers as their flyway to migrate south in the fall. About halfway between Williston ND and Sidney MT, not far from Fairview is the Missouri Yellowstone Confluence Center. It’s right next to Fort Buford and not far from Fort Union Trading Post. Colors are more varied here, reds intermingling with the yellows. You’ll also get a good chance to see waterfowl congregating on their annual trip south. The most rugged region of the state is also the youngest North Dakota Badlands region. Drive north of Killdeer on Highway 22. Before you drop down into the valley, turn in to the Little Missouri State Park. Autumn leaves are beginning to show their colors in mid-September at the Little Missouri State Park. It provides intense “in your face” landscape and vegetation. This year, there’s been a bit more rain in the region, so drought stress has not pushed the trees to maturity as in the south. The beauty hiking in this state park is the trails are marked according to difficulty. Even the easiest of trails is a good way to immerse yourself in the fall colors. Oh, there’s one more place we recommend to get this view. A late September view of the North Dakota Badlands. Where is it? We’ll tell you exactly where this is in a story coming up in a few days. Want to know where? Stay tuned. Subscribe. Watch Facebook. What places in the North Dakota Badlands do you recommend we check out while it’s still autumn? Where do your friends recommend? 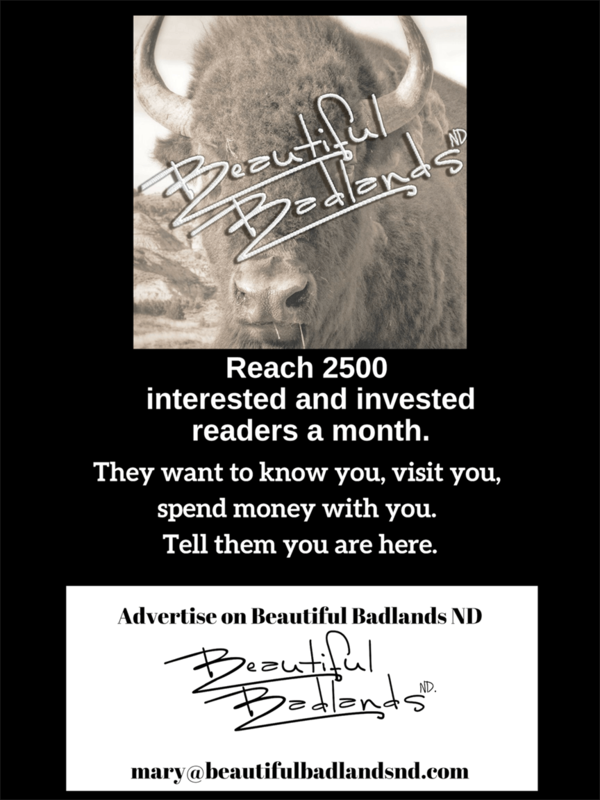 Share this with them so we can share the good stops in the North Dakota Badlands. Just click the “share” button. Where do you eat when you’re in the North Dakota Badlands? We have ideas we post each week called “Tasty Tuesday.” See what we recommend tomorrow…it’s a tasty treat you can do anywhere in the Badlands. Subscribe to get a note in your inbox when a new article is posted. The subscription box is in the upper right. Follow us on Facebook, because we post much more there, including videos and posts from other people who love these Beautiful Badlands.